MORRISTOWN, N.J.—The Unapologetic Study Bible—a resource that applies biblical truth to public square issues, from the church’s role in society to the status of socialism, the promise of adult stem cell research, evidences of intelligent design, the global-warming dispute, and justice in war and punishment —is available for pre-order and slated for release November 7. 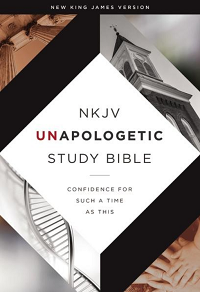 Published by Thomas Nelson, the Unapologetic Study Bible features more than 220 articles drawn from Kairos Journal, an online resource to help believers restore the church’s prophetic voice amid cultural decay. Unapologetic Study Bible articles are organized into eight distinct content areas: church, corruption, economics, education, family, government, sanctity of life, and virtue. The articles also vary in format and comprise quotations from historical figures, in-depth commentary on Bible passages, historical vignettes, and scripturally-informed analysis of current trends. – That the New Testament uses the same Greek word to reference both born and unborn children, suggesting they are equally deserving of protection. Each Bible book in the Unapologetic Study Bible is preceded by an introduction overviewing its content and identifying key passages. Indices in the back of the study Bible allow readers to study all the articles on a particular topic or survey all the topics addressed within a particular Bible book. Among contributors to the Unapologetic Study Bible are an international team of pastors and scholars, including the Kairos Journal editorial board. For more information about Kairos Journal, visit kairosjournal.org; for Thomas Nelson, visit thomasnelson.com.